There was colour, music, vintage cars and horse-drawn carriages. There was a plethora of marching bands, flags flying from nations across the world, anthems and tribal songs, cupcakes and sports to make up the annual Milad mawkib (procession). 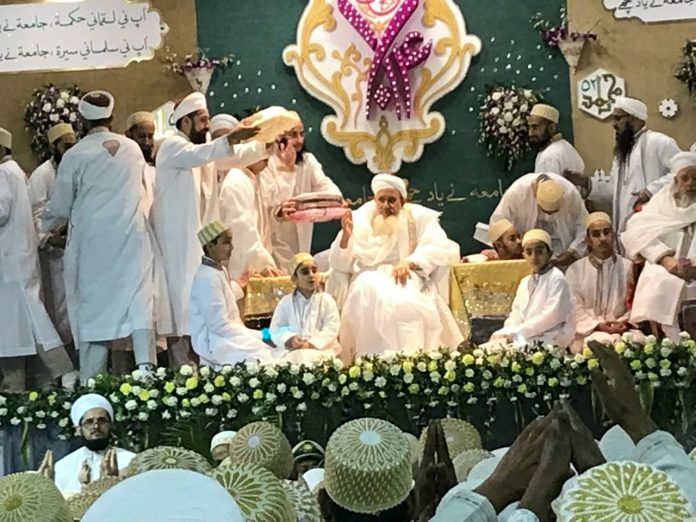 In a spectacle the like of which can perhaps only take place in the Dawat capital of Surat, thousands of Bohras formed the birthday celebratory procession for the late His Holiness Dr Syedna Mohammed BurhanuddinRA; a date which now doubles as the birthday celebration for His Holiness Dr Syedna Mufaddal SaifuddinTUS and Bohras have converged on the city from around the globe in their thousands. Many of these lined the route of the procession which began around 7pm Saturday and came to an end some three hours later. They stood to watch the array of groups and themes depicted. Beginning at Aljamea’s sports ground it wound its way through to the main thoroughfare before reentering Jhampa Bazaar at the Clock Tower. From here it went past the Devdi Mubarak – where a town’s amil resides and in Surat where the Dai’s residence is located. The road of Surat’s Devdi is also flanked by the campus buildings of Aljamea-tus-Saifiyah and the Quran Sciences institute, Mahad-al-Zahra. As the participants in the procession moved along the Devdi they came finally to the stage where His Holiness was sat, smiling broadly and acknowledging each of the groups as they sang out their prayers for his long and healthy life. It was a festival of love and goodwill that lit up the dark night and lifted hearts and souls both of those who were its participants and those who were its spectators. On Sunday, the day of milad, Dr Syedna Mufaddal SaifuddinTUS delivered a sermon lasting around 3 hours. Speaking on ‘justice’ and ‘godfearingness’ he urged his congregation to adhere to the practices of the Shariah with special emphasis on abstaining from the forbidden. Enumerating these vices, he spoke of the detriment of intoxicants such as alcohol and tobacco. Smoking, he told us, can upset a marriage, the foul smell driving a wedge between a husband and wife. A king should have justice, a scholar should have action, a pauper should have forbearance, a wealthy person would have generosity, a youth should have repentance and a woman should have modesty. The king without justice is akin to a river without water, a pauper without forbearance is like a lamp without oil, a scholar without action akin to a house without a roof, an ungenerous wealthy man is like a cloud without water, a unrepentant youth akin to a tree with no fruit and the immodest woman like food without salt. As is customary on all occasions for the Bohras, joyous or sad, Syedna concluded the discourse with an emotive remembrance of the events of Karbala and the martyrdom of Imam HusainAS, his progeny and his companions. In this sermon he made special mention of the slaying of AbbasAS, recalling how Imam HusainAS sped to where he had fallen, his sword drawn. He asked him to open his eyes and his soul left his body as he gazed upon his imam. Over the two weeks Syedna was in Surat he spent the major part at the resort area of Dummas. Here there were daily audiences for Bohras and religious rites such as marriages and oaths that he administered personally. At the same time some 3000 clergymen, dawat civil servants and ladies from the ‘muntasebaat’ (female alumni of Aljamea) had assembled to receive exclusive theology classes with the highest ranking officials. Lectures, presentations and academic gatherings took place for both ladies and gentlemen throughout the day. The students and faculty of Marol’s Aljamea were all relocated to Surat for the entire duration. In the late afternoon they would then make way to the Khaimat sports fields for walks around the track, racquet sports, cycling and other recreation. Physical fitness was a key component of the recent upliftment drive with diabetes being a focal issue. All of this came in the wake of the Upliftment period when the majority of these same people had spread out across the country to implement Syedna’s directives on upliftment. An exhibition detailing the fruits of their efforts was erected along with several interactive camps designed to provoke thought and introspection through psychological scenarios. Towards the end of the fortnight a further 3000 ladies and gentlemen of the community were selected to have high level classes over three days prior to milad. It made it a unique event in the community’s history as a scholarly, academic and intellectually inspiring series of sessions of a like, scale and scope that had not been seen before.